This is the third post in my Christmas gift guide series. Here are the first and second ones should you want to take a look. I have picked some interesting gifts that every man will love receiving this Christmas. The guide includes fitness, grooming, fashion and gaming gifts - something for everyone. These should give you some idea and I have included the relevant links should you wish to shop online. Beautifully gift boxed, this fragrant gift set is designed to keep the manliest of men smelling his best at all times. Mr.H has used this set and loves it. The set includes 100ml Eau de Toilette and 150ml Shower Gel both in a very refreshing masculine fragrance. You can layer both the products together to get the maximum scent intensity. Priced at £24.99, this gift set is an amazing buy. Packaged in a usable, BPA-free water bottle, the JAM Transit Micro Sport Bud Bluetooth Headphones are designed to stay in place comfortably. With a safe-surround feature that eliminates volume on one side, these headphones allow you to listen to your music while also letting you know what’s happening around you - perfect when you are on the road or in a busy place. The earbuds are sweat resistant making them perfect for use while exercising. Features like a completely wireless design, Bluetooth connectivity, rechargeable battery, integrated controls, up to 10 hours play time and speakerphone, make JAM earbuds a good choice for wireless headphones. Perfect for fitness lovers. Maui Jim, a Hawaiian polarised sunglasses brand, has an impressive range of sunglasses in a variety of classic and contemporary designs. Maui Jim lenses offer absolute protection from 100% of UV rays and glare and their technology also enhances the colour, so your view is clearer and with crisper contrast. With numerous frame designs and different lens colours, you are sure to find a suitable pair for the man you are buying for. I recently chose the Maui Jim Legends sunglasses with dark tortoise frame for Mr.H and he loves them. Light-weight, comfortable to wear, stylish and offering excellent protection the Maui Jim sunglasses have become his go-to pair. Read our review here. Anki is a thrilling, high-end racing game operated through your smartphone or tablet. To get started with Anki OVERDRIVE, you need the Starter Kit which includes 10 battlefields (tracks), 2 robotic supercars and 3 accessories. Once you have the app installed on your smartphone or tablet, you are ready to begin the race. Anki can be played solo or as a multi-player game. We have tried Anki and are sure it will be a big hit this holiday season. Their new super trucks add to the racing experience. Anki would not only be loved by the kids but would make an excellent gift for any 'big kid'. So, if your husband/boyfriend loves gaming, Anki is a great choice for a gift this Christmas. You can read over thoughts on Anki OVERDRIVE here. One of the latest grooming tools launched by Philips is the OneBlade which combines rotary shaving technology with the benefits of a trimmer in one simple tool. OneBlade is perfect for both shaving and facial hair edging and comes with 4 different clip-on combs that transform the tool into a trimming device. OneBlade can be used dry or wet with foam and once charged fully has a running time of around 45 minutes. OneBlade combines a fast-moving cutter with a dual protection system which means you get a smooth and comfortable shave. Another gift for fitness lovers is the Schiek Cross Training Fitness Glove. Available in a variety of sizes, these gloves can be used during weight training, fitness training or even cycling. The gloves are made from Amara synthetic leather (a light breathable material) and have a reinforced thumb area and a non-slip cool mesh back. Mr.H uses these gloves and he finds the fit to be comfortable and the gloves overall light. According to him, the gloves are perfect for weight training and cross training. 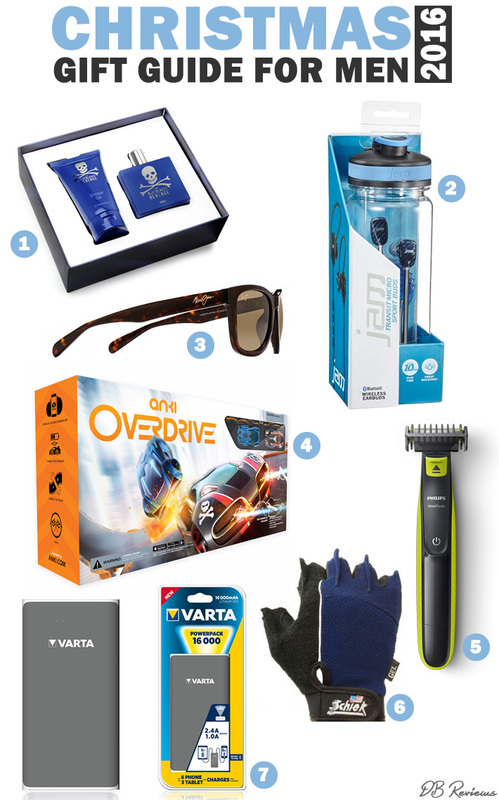 Consumer tech brand, Varta have a number of products that would make perfect gifts for the outdoor enthusiast or travel lover. From pocket-sized power packs to high-quality range of torches and from outdoor sports head lights to a universal charger range, they have all your tech energy needs covered. We have been using their portable Powerpack 16.000 mAh on our travels and have found it immensely useful. It can charge two devices at the same time and can charge not just phones but even bigger devices like tablets. With a sleek, modern design, an integrated LED flashlight and the ability to charge multiple devices, this power pack is ideal for longer trips. If you are looking to buy a gift for someone who travels a lot, the Varta Powerpack 16.000 would be a useful and practical gift.